Time certainly does fly. I can’t believe summer is almost here. But before it does arrive, I always like to share some ideas for homeschooling during the summer. I don’t know about you, but my children tend to get a little lazy during the hot summer months. Don’t get me wrong, I don’t mind giving them a break and toning down the intensity of our homeschooling, but I also want to keep them sharp. Too many children get what many of us homeschoolers call “summer brain drain.” The children work so hard all year long and then they nearly forget everything they learned. Then, in my case, I have to spend almost the whole first month of the new school year getting them back up to speed. It’s frustrating. Now I keep them learning but we change our schedule up a bit and have more fun. So even if you’re a traditional September through June homeschooler, an all-year long homeschooler, or somewhere in between, you can still use these exciting tips and boost your children’s summer learning experience. Fishing: Our children learn about the different bait and their habitat. We also study the game fish and their habitat. My youngest son knows everything about largemouth bass! They also learn about knot tying. Camping: We prepare an open fire and teach our children the importance of fire safely. We cook over the open fire and set up our own tents. Time at the ocean and bay: We collect shells, name and record the types of birds we see, and even get a little muddy as we explore the bay. It’s like having your own outdoor lab. Swimming: This is not only great exercise but our kids also learn CPR and water safety. Tennis: We play tennis as a family and the exercise and exertion helps our children burn off steam. Build your own list of fun teachable moments and your children certainly won’t mind learning about the great outdoor world through sports, recreation, and exploration. Every trip to a new town or city offers wonderful teachable moments. There are museums, nature centers, historic sites, parks, and unique aspects of a town or city that makes it special. We traveled to a small island off the west coast of Florida one year. I was worried that there’d be nothing for the children to do except swim and fish. I was wrong. Once I researched the place, I found out there are sacred Native American sites we could visit. We even took a tour and learned all about the Native Americans who made that tiny island their home. The island also had its own art community where local artists gave painting and sculpting lessons. The children absolutely loved it — and it was inexpensive. So go ahead, take a long weekend vacation or more, but don’t forget to research the area and find the unique aspects that make it a special place. I bet you’ll find some crazy fun and educational things to do. A summertime themed unit study is the perfect way to tackle homeschooling during the sunshine season. Below is a solid list of activities and lessons to add into your unit study. First up is our handpicked lessons from Time4Learning’s award-winning curriculum. If you haven’t subscribed to become a member of Time4Learning, summer is the perfect time to take advantage of their 14-day money back guarantee. One of the advantages of Time4Learning is that it travels easily because it’s an online curriculum. Simply login at your convenience, whether you are at home or away on vacation. Here’s a great video to explain how it works. Aren’t we so lucky to be homeschooling in the summertime? Now’s the time to get ready for the season and hopefully with these ideas and resources you’re already one step ahead. Also included below are games, videos, worksheets, writing prompts, and much more from a few friendly homeschooling sites. Thank you so much for pulling this together! I’m always looking for new ideas to chase away the inevitable ‘I’m borrrrred’ syndrome of the season! 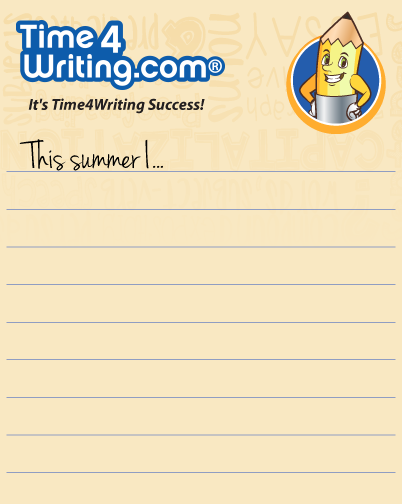 We loved using the Time4Learning summer lesson plans last year. The kids enjoyed them as a means to beat the heat that was both entertaining and educational. We then look for ways to get out of the house for fun. I appreciate you sharing the value of learning through play. As parents, sometimes we overlook those opportunities or don’t recognize the impact they can have. We’ll definitely keep this one bookmarked! Oh, this is perfect for keeping minds fresh throughout the summer. This summer is the first year we are trying to take off, but this will give them some things to work on without having to do a full load!